Last week I was poking around my library looking for something else when I stumbled onto this book. 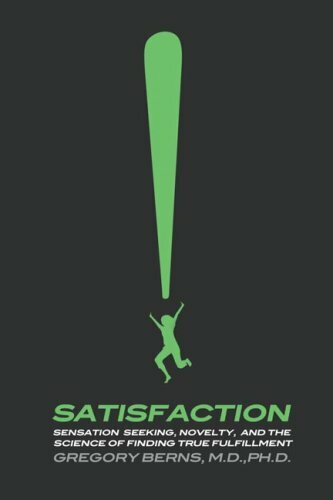 Satisfaction: Sensation Seeking, Novelty, and the Science of Finding True Fulfillment by Dr. Gregory Berns was better than I expected. He took a topic as geeky as brain chemistry and turned into an adventure. He went from Iceland to a crossword puzzle competition to an endurance race and more on a quest to solve the riddle of satisfaction. Along the way he setup tests and helped the reader understand the science stuff. Satisfaction is not the same thing as happiness and that is key to this book. Happiness can come whenever. Satisfaction requires action and some novelty. The human must connect their actions to the result in order to achieve satisfaction. Ice cream might make you happy, but unless you made the ice cream yourself it might not result in the feeling of satisfaction. And if you’ve made ice cream hundreds of times before, it may not have the novelty and thus its potential for giving you satisfaction. Too much novelty is stressful and too little novelty results in boredom. This book helped me understand why investing has not been more satisfying to me. I have made money when I’ve been right and made money when I’ve been wrong. On the flip side, I’ve lost money when I’ve been right and lost money when I’ve been wrong. There is often a disconnect between the actions of an investor and the outcome. In the end, we are still animals and I want a dopamine hit too. Satisfaction was a satisfying read. I also plan on checking out Dr. Gregory Berns new book Iconoclast: A Neuroscientist Reveals How to Think Differently. UPDATE (1/11/2009): I finished reading and have a review posted for Iconoclast.